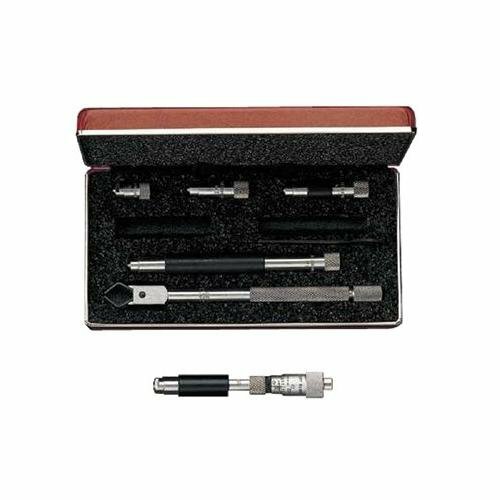 TUBULAR INSIDE INTERNAL MICROMETER PRECISION SET 2" to 12"
Mitutoyo Tublar Inside Micrometer, Graduations: .001", Range: 4 - 40", Mic head travel: 1". 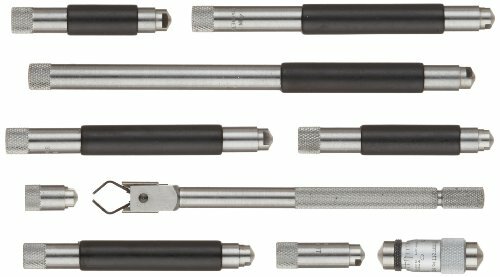 Extension rod type Inside Micrometers have a wide measuring range-any one single micrometer can replace many bar type inside micrometers. 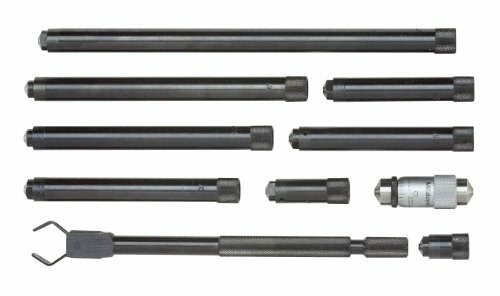 Each set consists of an inside micrometer head and a series of fully hardened and lapped extension rods of different lengths. Anvil and spindle are hardened and precision ground with microlap finish on ends. Spindle thread hardened, ground & lapped. Microfine graduations on satin chrome. Positive locking nut on spindle. be calibrated by a micrometer or ring gage. Coiled spring pressure contact type rods are each marked with appropriate length. Quick, easy zero adjustment on the sleeve. Meets or exceeds Federal accuracy specs. Reference standard included with set. Includes a wrench and a fitted case. Range: 2" to 12" Graduation: 0.001"
Positive locking nut on spindle. be calibrated by a micrometer or ring gage. High quality alloy measuring heads can be used for various internal size measurement, fine workmanship and no burr. Clear laser marking line for convenient reading. 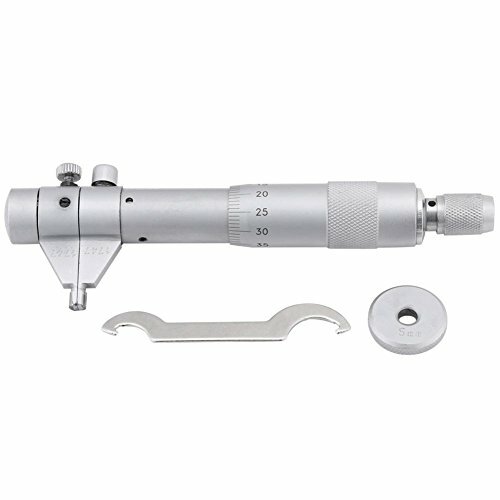 The main micrometer body is made of stainless steel with chrome plated surface, wear-resisting and durable. Designed with locking device, precise machinery structure make it more intuitive and convenient to read. Built-in ratchet stop device ensures accurate repetitive readings. Clean the surface of measuring anvil heads with a soft cloth, then rotate measuring device to make two measuring surface contact. If two zero lines of differential sleeve and fixed barrel do not alignment, use the following two methods to adjust. Method I, if the error is less than 0.02mm (0.001"), use ratchet stop to lock screw tightly, then use wrench to pull fixed barrel till two zero lines alignment. Step1, use ratchet stop to lock screw tightly, then use wrench to loosen the ratchet stop and remove differential sleeve. Step2, re-align zero lines of fixed barrel and differential sleeve, then put ratchet stop back on. If necessary, adjust it again using method I. Note: There is no need to calibrate micrometer during common use. Micrometer only need calibration when it is severely worn. 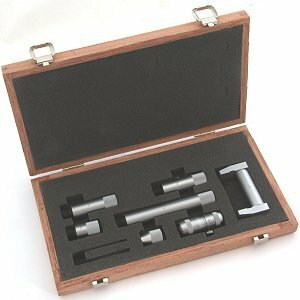 PREMIUM QUALITY This inside micrometer kits is made of superior stainless steel with chrome plated surface, wear-resisting and durable, not only bring you a better experience but also provide a longer service time. PRECISION Clear laser marking line for convenient reading, measuring faces are fully hardened, precision ground and microlap finished to assure exceptionally accurate measuring. Measuring range is about 5mm~30mm, accurate is 0.01mm. 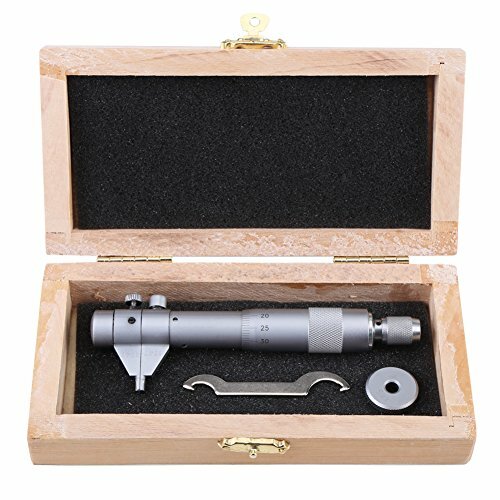 PACKAGE LIST If you purchase this product, you will receive 1x inside micrometer+1x wrench+1x calibration ring+1x wooden packing box. APPLICATION The internal diameter gage gauge is great for measure the hole, groove depth and height of the workpiece and etc. SERVICE If there is any questions, please feel free to contact with us without hesitation, we aim to provide a better range of services. The Mitutoyo 368 series Holtest vernier inside micrometer has three-point contacts for self-centering measurement of the inside dimension (ID) of bores, and a vernier scale in inch units for taking precise ID measurements. It also has a ratchet-stop mechanism that helps provide uniform pressure for precise, repeatable measurements. The micrometer is made of high-grade tool steel for durability and has a satin chrome rust- and glare-resistant finish. The vernier scale is graduated to 0.0001 or 0.0002 depending on the model. The measuring faces are carbide-tipped or TiN-coated for wear resistance depending on the model. The micrometer comes with a fitted case for storage. 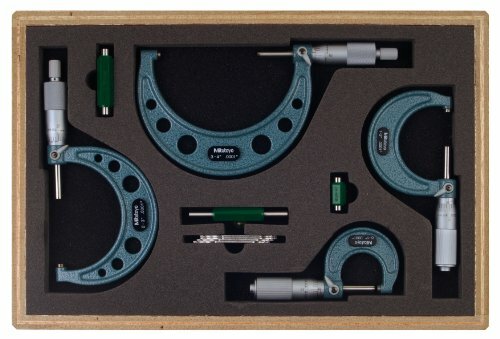 Mitutoyo Tublar Inside Micrometer, Graduations: .001", Range: 1.5 - 12", Mic head travel: .500". Highly useful for internal linear measurements such as measuring cylinders, rings, setting calipers and parallel surfaces. Caliper type jaws. Chrome-plated Carbide measuring faces. Ratchet stop for exact repetitive readings. Complete with fitted case. Professional Grade Precision Measuring Tool Use Depth Micrometers for measuring the depth of small holes, small fabricated articles with grooved or elevated surfaces or different depths or heights. Particular attention has been paid in obtaining the accuracy of the contact surface of the rod and its straightness. Features: Clear microfine graduations .001" on satin chrome finish. Flat probe Base of tool steel hardened, precision ground and microlapped. All other surfaces satin chrome finished. Base length: 4" Includes 6 Rods for measurment of 0-6". Quick and easy zero adjustment. Rods hardened, ground and lapped on measuring surfaces and adjustable in either direction. Measuring range per rod: 1" Rod diameter: 0.176" Interchangeable rods are fitted to the micrometer spindle against a positive stop and locked. Ratchet thimble for consistent repeated accuracy. Threads hardened, ground and lapped for accuracy. Meets or exceeds Federal accuracy specifications. Includes calibration spanner and fitted case. Fowler 52-275-005-0 Xtra-Range Inside Micrometer, 0.2-2.2" Measuring Range, 0.001" Graduation, +/- 0.0002" Accuracy. Microfine graduations (.001" or .01mm) on a satin chrome finish permit easy reading. With Fowler Inside Micrometer, you are assured of smooth operation and stabilized uniform accuracy. The frame is specially designed to enable the micrometer to provide extremely accurate small internal measurements. Measuring faces are fully hardened, precision ground and microlap finished to assure exceptionally accurate measuring. Ratchet stop thimble assures exact and repetitive readings. Easy zero adjustment on the sleeve. Meets or exceeds Federal accuracy specs. Fowler 522750050 0.2-2.2" inside micrometer comes with a setting ring, a spanner wrench and a case. Fowler 52-275-005 inside micrometer comes with setting ring, a spanner wrench and a case. It also has full 1 year warranty offered by Fowler High Precision. If you experience any problem contact Fowler directly for warranty claims. Micrometers are precision measuring instruments that use a calibrated screw to measure distances. These measurements are translated into large rotations of the screw that are then able to be read from a scale or a dial. Micrometers are typically used in manufacturing, machining, and mechanical engineering. There are three types of micrometer: outside, inside, and depth. Outside micrometers may also be called micrometer calipers, and are used to measure the length, width, or outside diameter of an object. Inside micrometers are typically used to measure interior diameter, as in a hole. Depth micrometers measure the height, or depth, of any shape that has a step, groove, or slot. The Mitutoyo 145 series vernier inside micrometer has caliper-type jaws and a vernier scale in inch units for making precise inside dimension (ID) measurements. The micrometer is made of high-grade tool steel for durability and has a satin chrome rust- and glare-resistant finish. The measuring faces are carbide-tipped for wear resistance. The vernier scale is graduated to 0.001 . A locking clamp helps hold measurements in place. The micrometer comes with a fitted case for storage. The Mitutoyo 293-349-30 digital micrometer has a 0 to 1" (0 to 25.4mm) measuring range with 0.00005" (0.001mm) increments for precision and a friction thimble stop with carbide-tipped measuring faces for consistent measurement. Its digital readout LCD shows inch or metric units for versatility and a Hold button saves a measurement for reading later. The digital micrometer is Ingress Protection certified IP65 for protection from dirt and water and includes a protective case and SR44 silver oxide battery. 681-50542 Features: -Micrometer Set. -Insulated rods marked with length. -Adjustable for length. -Measuring rods are solid. Product Type: -Meters. Generic Dimensions: -6.5'' long handle is available (124H). Dimensions: Overall Product Weight: -2.76 Pounds. 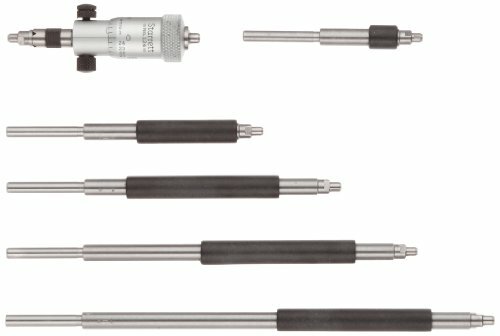 The Mitutoyo 137 series tubular vernier inside micrometer includes a set of extension rods with anvils for a diversified range of measurement measuring inside dimensions (ID) of cylinders, rings, and parallel surfaces. It has a vernier scale in inch units for taking precise ID measurements to 0.001 , and a satin chrome rust- and glare-resistant finish. 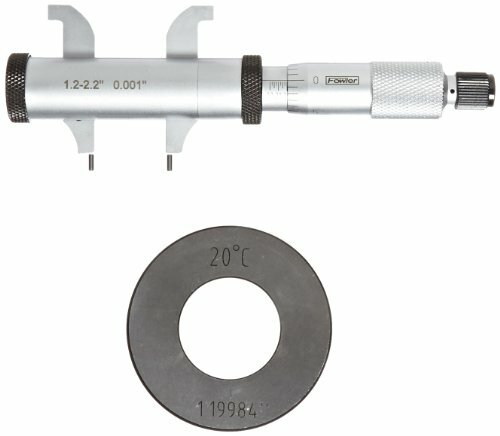 The micrometer head has a travel of 0.5 per revolution that helps provide fine positioning. The solid extension rods help provide durability, and the measuring faces are carbide-tipped for wear resistance. A locking clamp helps hold measurements in place. The micrometer and accessories come with a fitted case for storage. Welcome to visit SANURE,a amazon store registered the TOPINCN brand. Please feel free to Add to Cart if you are interest in this item. Hope you have a good shopping experience here. And any question please do contact us without hesitation,we are here to support you. AFTER-SALE GUARANTEE: Sanure is only seller authorized by the TOPINCN brand. We guarantee you have a good shopping experience. Please feel free to contact us at first if there is any problem,and we are always here to support you. 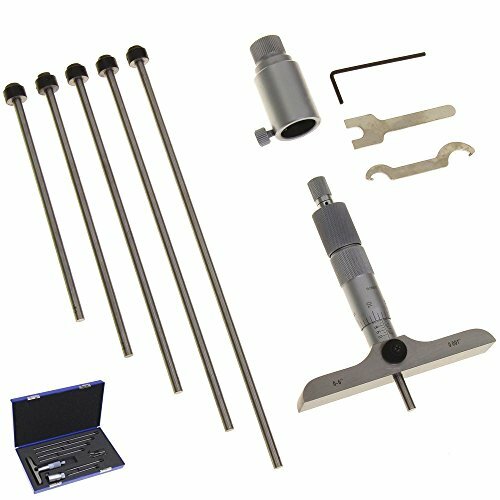 681-50546 Features: -Solid-Rod inside micrometer sets. -Insulated rods marked with length. -Adjustable for length. -Measuring rods are solid. Product Type: -Meters. Dimensions: Overall Product Weight: -2.16 Pounds.